The Polyco Nitri-Tech III Chemical Resistant Gloves are chemical resistant safety gloves that offer protection from a wide range of chemicals including strong detergents, oils and certain solvents. Attaining the highest score for abrasion resistance, the Polyco Nitri-Tech III Chemical Resistant Gloves offer a durable and reliable level of protection to the user. Available in both flock lined and unlined these safety gloves feature an anti-slip pattern on the palm to enhance grip, making them ideal for a users that require personal protective equipment for jobs involving food and chemicals. 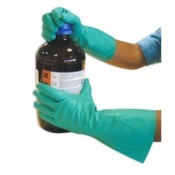 The Polyco Nitritech III Chemical Resistant Gloves are also available in a pack of 12. 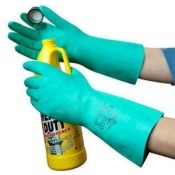 Polyco Nitri-Tech III Chemical Resistant Gloves are reusable nitrile gloves that perform well against a wide range of chemicals including strong detergents, oils and certain solvents. With the highest score rating for abrasion resistance, the Polyco Nitri-Tech III Chemical Resistant Gloves are well suited for environments with abrasive materials and chemicals where the need for reliable personal protective equipment is a necessity. A slip resistant, diamond pattern on the palm of the Polyco Nitri-Tech III Chemical Resistant Gloves give an enhanced grip capability in both wet and dry conditions. This is ideal for situations where users may be handling and carrying potentially harmful chemicals and therefore require a better grip. Anatomically shaped for maximum comfort. 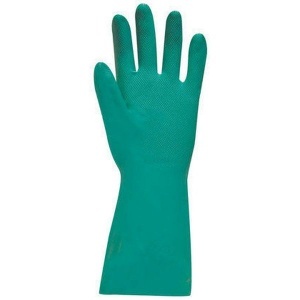 The Polyco Nitri-Tech III Chemical Resistant Gloves are available with a flock lining in green or blue, or without a flock lining in blue. The advantage of the soft flock lining is that it absorbs perspiration keeping the hands cool and dry. Made from synthetic rubber, the Polyco Nitri-Tech III Chemical Resistant Glove contains no latex protein and thus are suitable for those with latex allergy. This also eliminates risk of latex sensitisation for users repeatedly wearing these safety gloves. The Polyco Nitri-Tech III Chemical Resistant Gloves have been tested and successfully passed the surface sensitivity requirements of EN 1149 pt 1:1995. 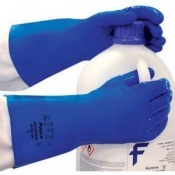 The Polyco Nitri-Tech III Chemical Resistant Gloves Gloves are latex free. This product is cut and puncture resistant but not cut and puncture proof. Do not use with moving or serrated blades or tools. Always conduct a safe test to make sure it is suited for your uses. The information contained on this site is intended to assist the wearer in selection of Personal Protective Equipment. The results of physical tests should also help in glove selection however, it must be understood that actual conditions of the use cannot be simulated and it is the responsibility of the user not the manufacturer or supplier to determine the glove suitability for the intended use. A good quality glove. Would like a softer interior if this was possible. The price is very good indeed. Fantastic service, great gloves if you have skin problems as these are latex free. Would recommend Safety Gloves for the efficient service. I use these gloves every day, they are hard wearing compared to other makes I have tried. The service from Safety Gloves.co.uk was really good also, ordered one day arrived the following day.